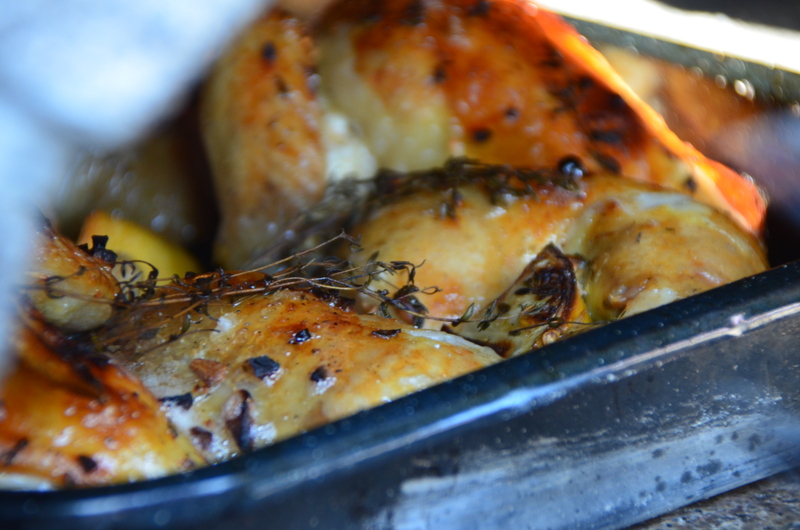 Fast, Easy And Oh So Delicious Roast Chicken! 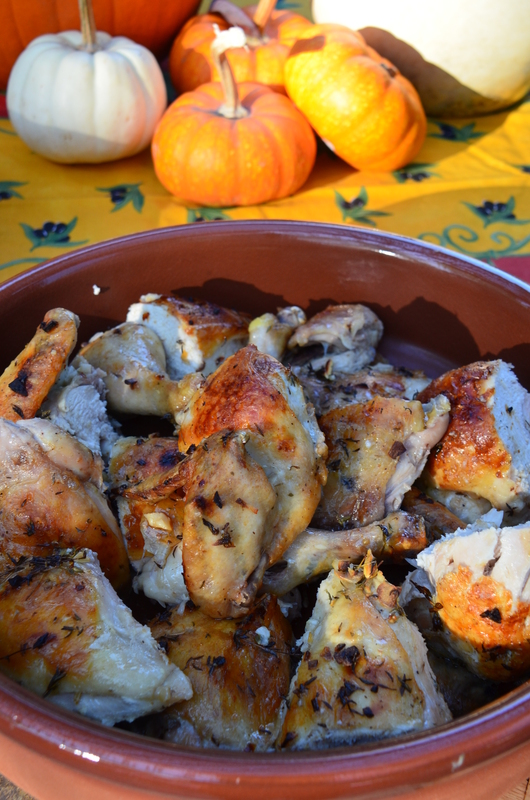 Lets face it we eat a lot of Chicken because it has less fat than red meat, it cooks quickly and it is soooo versatile. We love roast chicken, but it can take over an hour to cook a whole chicken. The white and dark meet seem to cook differently leaving the legs and thighs a bit underdone if the white meat is just right or the white meat is dry when the dark is cooked to perfection. But fear not, we’ve come up with the Perfect Roast Chicken! The secret is in cutting out the backbone of the chicken in a method called spatchcock. Watch the technique on spatchcock chicken. Place chicken breast-side down, with the legs towards you. Using sturdy scissors or poultry shears, cut up along each side of the parson’s nose and backbone to remove it, cutting through the rib bones as you go. Open the chicken out and turn over. Flatten the breastbone with the heel of your hand so that the meat is all one thickness. Prepare the chicken by removing the backbone as per the video above. Place the chicken in a large Ziplock bag. Grate the peel from the lemon, squeeze out the juice and cut the remaining lemon peels into pieces. mince the garlic and add all the flavoring ingredients to the bag. Allow the chicken to marinate in the fridge for a minimum of 1 hour, preferably up to 4 hours. Remove from the fridge 1 hour before cooking and arrange the chicken and all the flavorings in an oven proof dish with 2 inch high sides. There will be some great pan juices to spoon over the chicken when it’s cooked so you need a pan with sides. The chicken takes about 40 minutes in a hot oven at 400F. You will know its done when the leg bones pull away from the meat easily. 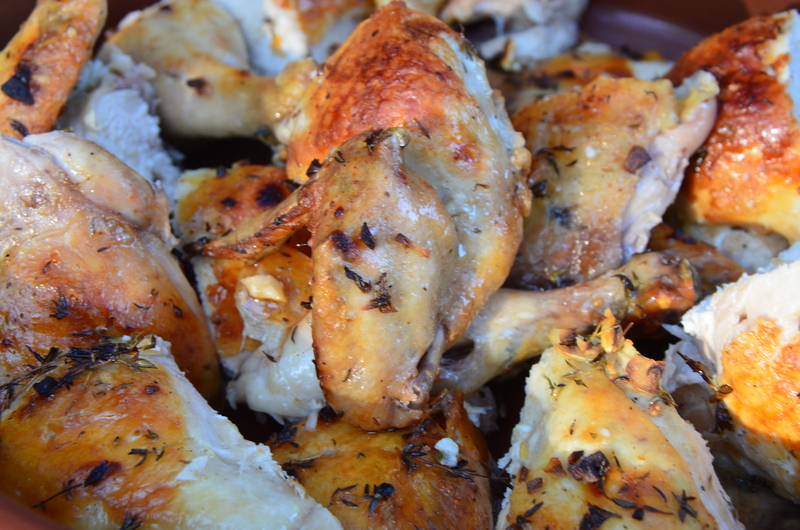 This is the juiciest most flavorful Roast Chicken you will ever eat! The white meat will be fully cooked not dry and the legs and thighs will be succulent with no pink areas. We know this will become one of your family’s favorite weeknight dinners hands down! If you love this recipe, be sure to share it with your friends and family! Leave us a comment too! we like to hear from our readers.